It's Tutorial Tuesday and today's project is one dear to me. It's probably not technically a craft project, but it's something you can make so maybe I can count it as one. I definitely count it as a project that helps make the world a better place. Or at least one that makes someone's day. For the last several years I’ve been giving away dollar bills with notes of encouragement. I used to hand write notes on packs of Post-It notes but I found the adhesive wasn’t sticking in high-humid climates we were traveling to. 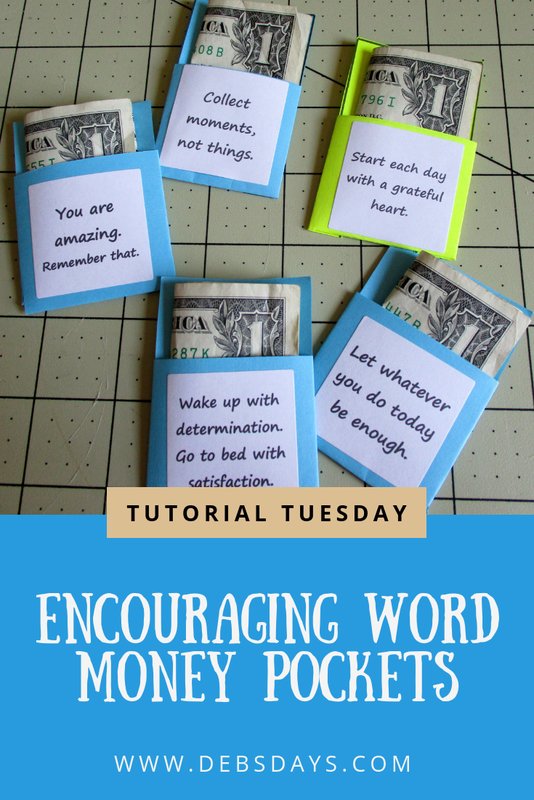 A couple years back I switched to making my own little money pockets and printing labels for them. I’ve left them in restrooms and airplane magazines and sugar containers. I’ve left them in windowsills and tip jars and hotel room drawers. I’ve left them on buses and taxis and trains. Sometimes I place one somewhere once a day and other days I drop them off multiple times. If you'd like the template for the labels themselves (it's a Word document) just email me - link is on the upper right of this page - and I'll send it your way. Today I will be delivering my money pockets all throughout Boise as I make a birthday-freebie run today. Happy Birthday to me! I'm taking notes today so come back on Friday to find out how the food-filled, freebie-filled birthday went. It's going to be a crazy one. If you'd rather not make your own pockets, a library pocket might be larger but could be a nice substitute.